In a previous post, I explained how to use low-priority shopping campaigns to segment traffic and products by search queries. In this post, I’ll explain how to use high priority shopping campaigns to segment products by performance. This is a powerful tactic and one we use frequently. To give you a sense for the value of the approach I’m about to explain, in one example, we drove a 30% increase in traffic and 32% increase in shopping revenue for top performing products for one of our clients – and the jump was pretty close to immediate. A common pitfall we see when taking over shopping campaigns occurs when a large number of products, with varying performance, are grouped together in a single product group. One high-traffic, high-performing product may make this group look strong, telling us to raise our bid for the product group as a whole. However, when we look at the data at the product level, we can tell that only one product is performing well and many of our other products are not. If we aren’t careful, we might overvalue (and overbid) the lower performing products, while undervaluing the high performing product. So how do we make sure we are appropriately segmenting our product groups to account for these outliers? For starters, regular analysis of our Medium Priority, general shopping campaign is essential. However, with larger feeds, this can quickly turn into an extremely time consuming process. To help with this, we can use custom labels and campaign priorities to automatically filter high and low performing products into product groups with more appropriate bids. If the target ROAS for our Non-Brand Shopping campaigns is a 4.0, we might want to set up a rule that automatically labels any product with a significant amount of traffic in the past month and a ROAS over a 6.0 as a “High Performer”. By the same token, any product with significant traffic and a ROAS under 2.0 may be labeled as a “Poor Performer”. Make your own decisions regarding the boundaries you want to set up to label your products, but you will want a significant amount of traffic so that you have a large enough sample size to analyze performance. Obviously, these rules will be much easier to put in place with the help of a feed management solution, but it’s still possible to set them up in Excel. Once we have these custom labels created, we will want to set up a High Priority shopping campaign and structure it identically to our Medium Priority, general shopping campaign down to the product type or category level. Now, we will want to segment out traffic even further based on custom labels. Let’s pretend we are a sporting goods store for this example. We may have one Ad Group for all Hockey related supplies. 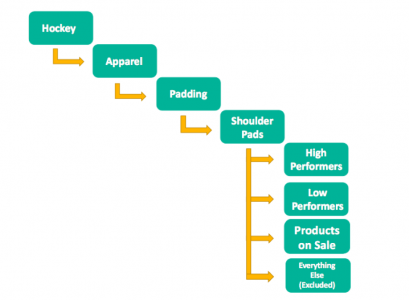 We may then have a product group segmented through the following product types: Hockey > Apparel > Padding > Shoulder Pads. This will allow us to set a bid for all our hockey shoulder pads. We now want to segment our group one step further using our High and Low performer custom labels. While we have used High and Low Performers as an example in this post, we can use the same logic and structure to segment sale or promotional items. We simply need to create another product group at that same level as our High and Low Performers in our High Priority campaign, and enter a new bid. This way, we are able to increase bids automatically to all items on sale. A crucial step to remember here is to exclude “Everything Else”. Using this set up, the only product groups that will get traffic in this High Priority campaign will be High Performers and Low Performers. Now you will want to go in and make sure appropriate bids are set for each of these new product group levels (higher bids for the High Performers and lower bids for the Low Performers). Proper traffic and product segmentation is essential to a successful Shopping account. Follow these steps to properly utilize campaign priorities and custom labels to create a structure that allows you to do so quickly and efficiently.